I mixed a big batch of henna last night, and left it to oxidize. I was going to use it today but I've found I don't really have the time today since I'm working at three. Can I leave it out (in a plastic bag, air squeezed out) til tomorrow morning or should I refrigerate it? I'd throw it in the fridge. If it gets delayed further than that, freezer. I would freeze it. Depending on what type of henna you're using and the temperature it's been sitting out at, it can start to die in as little as 4 hours. Anything past 12 hours and I would start to think it wouldn't stain very well. 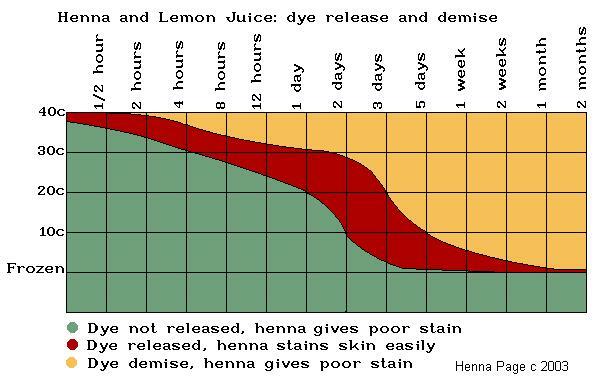 You have to wait for henna paste to release dye so it will stain skin. Then, you have to use it before the dye "demises". After your henna releases dye, it is in contact with oxygen (unless you have a way to inert the paste). If oxygen combines with the dye, it won't bind with the keratin in your skin, and you'll get a poor stain. This is "demise", when henna stains poorly because you have waited too long to use it. ok, so i left it in the fridge and just stuck it in the freezer now. so ill defrost it tomorrow and use it in my hair once i get home from work at 1pm... thanks for the advice ladies.